The Sy family emerged as the richest clan in the country—17th in Asia— according to the latest ranking of business publication Forbes Asia. Henry Sy, the country’s richest billionaire for the ninth consecutive year, chairs SM Investments Inc. (SMIC), which recently reported an 11 percent net income growth for the first nine months of the year at Php 22 billion. Earlier this year, the company consolidated all of its retail brands under SM Retail which now has 55 SM Stores, 47 supermarkets, 45 hypermarkets, 147 SaveMore branches and 34 Waltermart locations. According to Forbes Asia, the family has a net worth of US$ 12.8 billion. The Zobels ranked second in the country, and 37th in the continent with US$ 5.1 billion of reported net worth. Jaime Zobel de Ayala, former chairman of Ayala Corporation, was hailed as the seventh richest billionaire in the country in August similarly by Forbes. His son, Jaime Augusto Zobel de Ayala succeeded him, leading the company to a 32 percent net income surge for the first half of the year at Php 13.8 billion. The Ayalas have businesses in telecom, transportation, power, real estate, banking and retail. The family has an estimated US$ 5.1 billion of net worth. 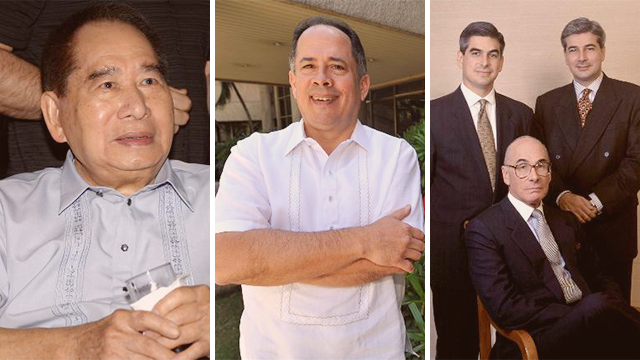 Not far behind is the Aboitiz clan at 39th place, with a net worth of US$ 4.9 billion. Their conglomerate, the Aboitiz Equity Ventures Inc. experienced a 34-percent net income surge for the first half of the year to Php 10.5 billion. The company has interests in energy, real estate, banking, infrastructure and education. The family was also recognized as the country’s richest givers by Forbes Philippines in its March 2016 issue with almost Php 800 million worth of philanthropic works. Collectively, the Filipino families have a combined net worth of US$ 22. 8 billion. They are joined by Samsung’s Lee Family from South Korea which has US$ 29.6 billion of net worth. They emerged as the richest clan in Asia. Still, most of the richest families on the list hailed from India. The publication noted that all families came from various industries spanning livestock, technology, real estate and retail. Collectively, they are worth US$ 519 billion. “Fortune has to extend to at least three generations for families to qualify on the list,” wrote Forbes Asia.